Breakfast is even worse today because there are no bananas to go with the yoghurt. “We’ll have some tomorrow” says the server. No use to me mate, I’ll be long gone. 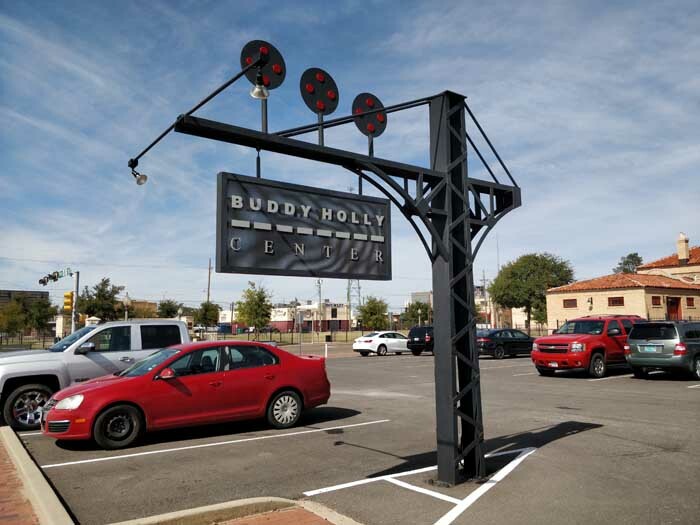 After I’ve checked out I drive into the centre of Lubbock, past the Triple J and Blue Light, and arrive at the Buddy Holly Center. There’s a short 20 minute film as an introduction. 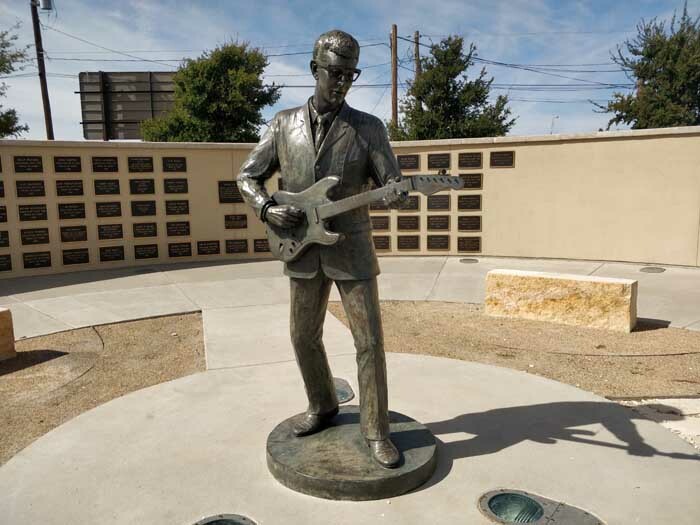 It was clearly made a long time ago given the youthful appearance of the rock stars interviewed for their thoughts on Buddy Holly, and the impact he had on them. No photos are allowed inside the medium-sized exhibit room as I expected. First problem is one end of the room is given over to a timeline overview of popular music’s development in the 20th Century. 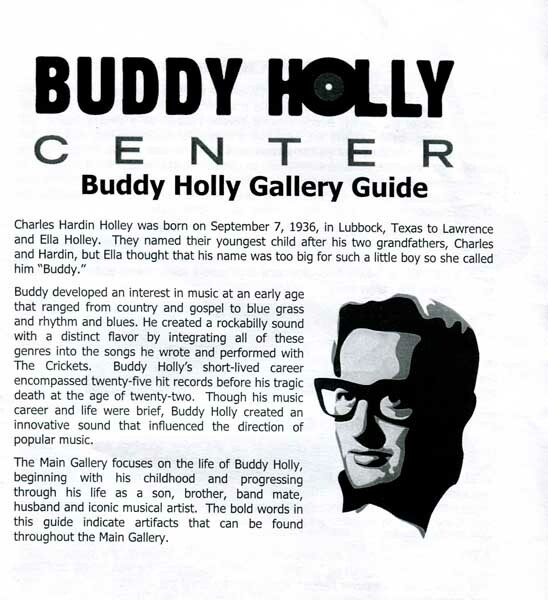 In other words, the story of pop, in which Buddy gets mentioned just a few times. I can’t really see the point of this exhibit. There’s another timeline of panels at the other end, specifically about Holly, which is good. In between, mostly around the walls but with some island cabinets, are display cases with filled with artefacts and memorabilia. I assume these are all Buddy’s or related to him. 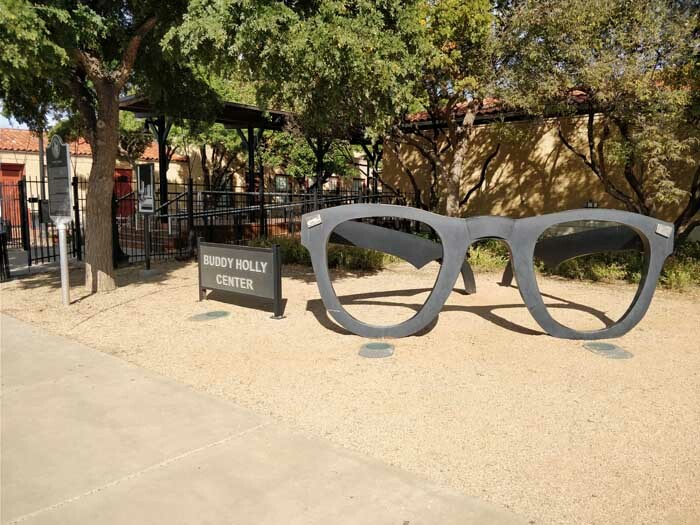 I say assume because apart from a few items – one of his guitars, his actual horn rimmed glasses recovered from the plane crash that killed him (that are amazingly intact and without a scratch) – there are no information cards by the majority of the items. What’s worse is that many items (and the few info cards that there are) are set so far back in the display cabinets that you cannot read any writing. 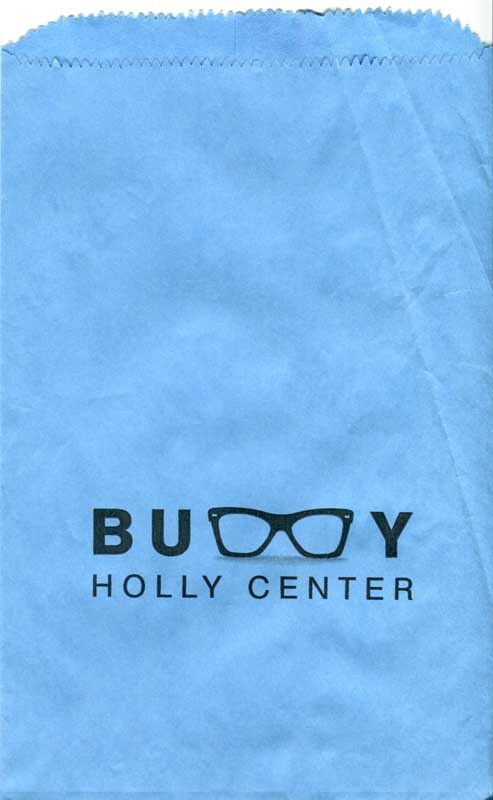 For instance there appears to be documents from Buddy’s school days, contracts from various stages of his career, photos and other things, but for the most part you have no idea exactly what you are looking at. The whole room is very poorly done and is a huge insult to the memory of such an influential figure. Whoever curated this exhibit should be ashamed. It’s very, very disappointing. I buy a postcard in the gift shop to send to my Mum back home in the UK, then head outside. 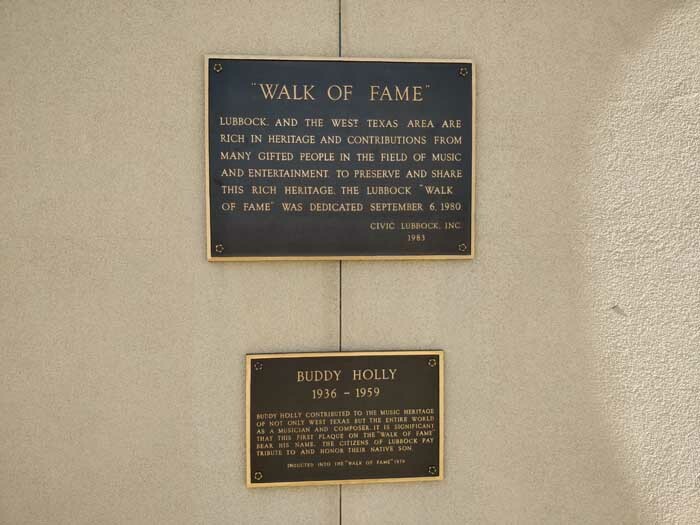 Just across from the Center, there’s the West Texas Walk of Fame with a statue of Buddy in front. But yet again there’s nothing to explain who the other people are that are listed in the Walk of Fame. There are a few musicians I recognise, but not many. Pretty poor show again. Time to leave. After a short detour to a post office to buy a stamp for the postcard, I hit the road south towards San Angelo. 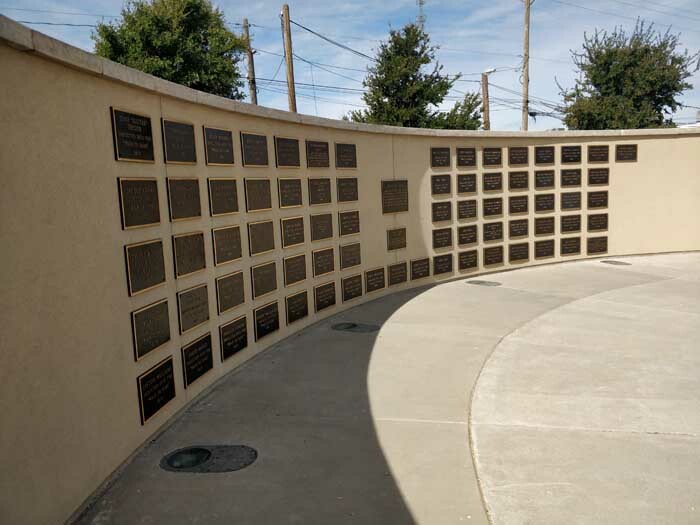 For the first part of the journey I’m retracing my route on US-84, but south now. This is a bit of a downside of Maps suggesting a quicker route from Dallas to Lubbock as my original route was further north and I wouldn’t now be doing the same road twice. But it’s not too far. Around 1 pm I stop in Post for lunch at a Subway. 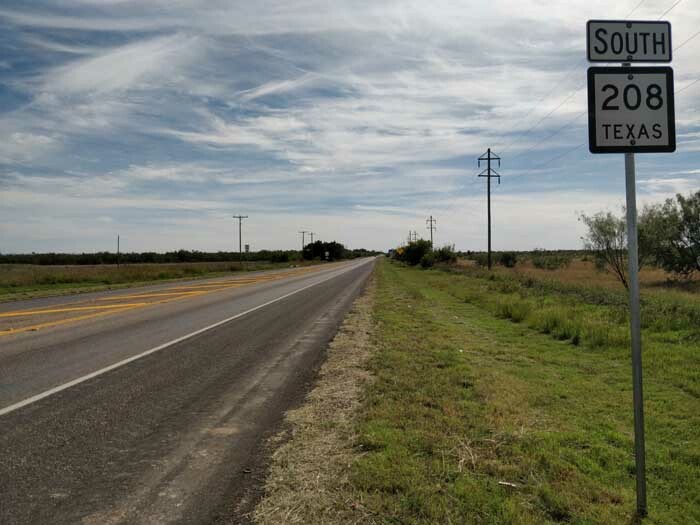 At Snyder the road changes to TX-208 S and the scenery does as well, with some hills and greenery replacing flat fields. The road also alters with some sweeping bends. 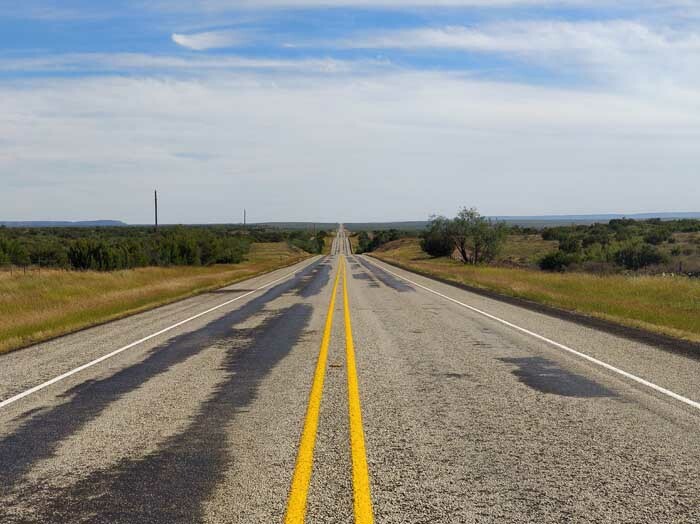 The speed limit is 75 mph on a single lane highway and the road surface is very good. With almost no traffic and good visibility, I manage to maintain that speed almost all the time. The weather is bright with just a few clouds in a blue sky, and a temperature in the low 80s. It’s a great and enjoyable drive. As none of my hotels from now on have breakfast included, on the outskirts of San Angelo I look for a 7-11 or similar. I find a gas station with a 7-11 attached but it has no fruit or yoghurt. I search online for the next nearest one but before I get there I pass a WalMart Grocery store so pull up to go in there. There’s a much wider choice than I’d get in a 7-11 as you’d expect, so with breakfast purchased I go back to I-67 that I passed under a few minutes ago. The Motel 6 San Angelo is located next to it. 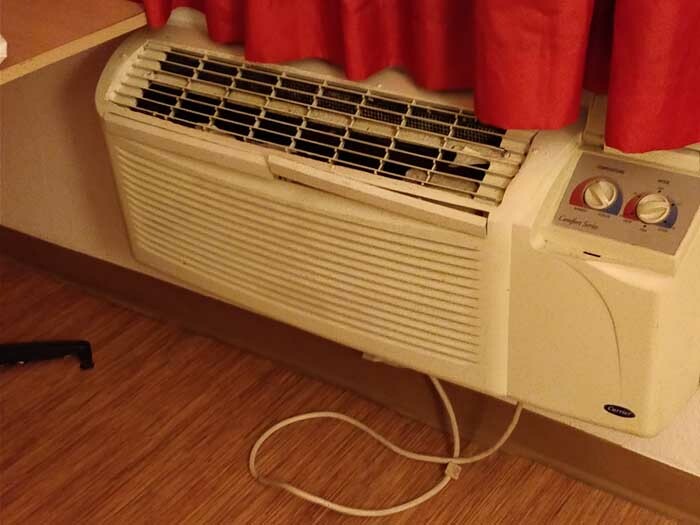 At the grand price of $46 for the night I was not expecting much. I was not disappointed. It’s a dump, basically. At least the bed sheets appear clean. I booked a room with a kitchenette, for the fridge, of which there is no sign. So I go back to reception where the receptionist offers me another room, which she says does have a kitchenette. When I go to view it, it does not have one either. On returning to her, she says there is nothing she can do as there are no other free rooms. I suspect however that there are larger rooms available but she won’t upgrade me. She just offers me two extra ice buckets to keep my breakfast cool. Looks like I’ll have to complain when I’m back home. I get rid of the car after tomorrow’s drive. So tonight I repack my suitcase with all my dirty clothes. I keep these in plastic bags in the trunk so as each day goes by, all I have in my suitcase is clean clothes. By the end of the trip, it’s almost all dirty of course. Later on in the evening I walk for about 15 minutes into the centre of town to the Zero One Ale House, the best rated San Angelo restaurant on TripAdvisor. 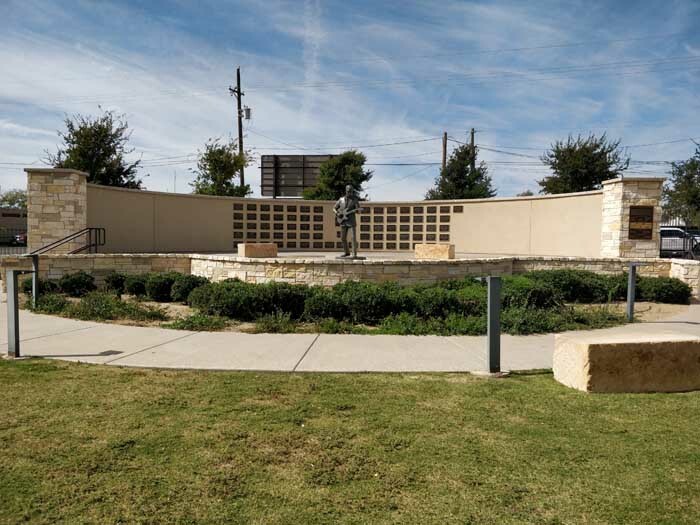 I’d picked up a leaflet earlier in the trip that implied San Angelo had some old town features but all I see as I walk from the motel is modern shops and offices. The Ale House is OK. It’s not very busy, there are some people at the bar but no-one talks to me so I spend my time reviewing and sorting my photos on my phone, deleting the rubbish ones. I have a Tri-Tip Steak Sandwich and it is very good, there’s a nice bit of spice to the BBQ sauce. I try various craft beers on offer and these are all good as well. It looks like the TA reviews were correct. All fed and watered, later on I walk back to the motel along streets deserted of people and cars. I don’t see another soul until I near the motel. So, a so-so day. 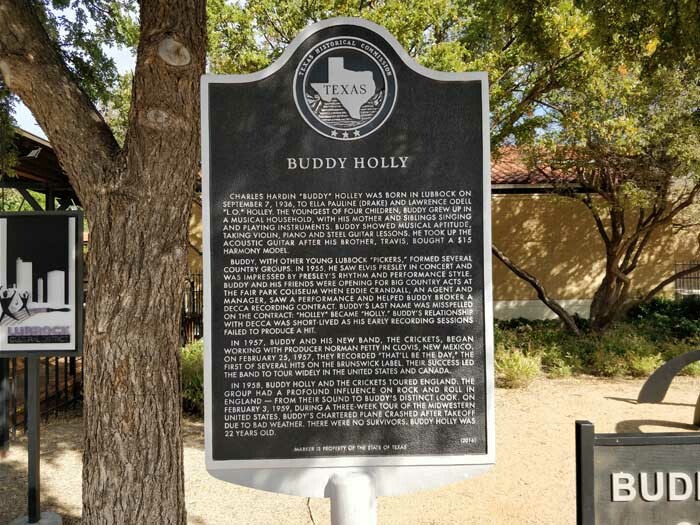 A very big disappointment with the Buddy Holly Center followed by a good drive south. It’s the last day driving on this trip tomorrow but there are still a few more days to go yet overall. More fun to come, I hope.